The core team at SGE is a maverick bunch of six from four continents, speak eight languages amongst us and come with a combined experience across 15 industries. Within such diversity we have one thing in common, a burning desire to succeed. Mr.Gantt has more than 17 years of experience living and working around the world - focused on entrepreneurial ventures, international business, channel partner development/management, and implementation of best practice methodologies. Prior to joining SGE, Mr. Gantt founded multiple international companies across a range of industries. In addition to his start up experience, Mr. Gantt understands the high demand corporate nuances having managed the Asia-Pacific region for a NASDAQ publicly traded company. Among his entrepreneurial ventures, Mr. Gantt founded and operated a Singapore-based consulting/trading company that bridged the gap between Asia and the rest of the world and co-founded a multinational construction and development company that has operated throughout Africa and the Middle East. Mr. Gantt's background is well suited to SGE's growing portfolio, specifically targeting growth opportunities in the IT, land development and associated sectors in emerging markets. Mr. Gantt graduated from The Citadel, The Military College of South Carolina, with a BA in Political Science/International Affairs and a BA in French. Maher has more than 25 years of experience in multi-national company management, business development, construction management, and technical equipment sales and operation. Prior to joining SGE, Maher co-founded a consulting engineering and construction management firm with offices in Dubai, Abu Dhabi and Lebanon. He has held positions focused on business development and sustainability and facility management at a major US construction firm and has been a regional manager for a US-based Fortune 500 firm with global reach. Maher's proven track record in business development, creating and implementing acquisition plans, developing and spearheading strategies in support of corporate goals and providing vision and setting goals for business development activities is an integral part of SGE's placement agent practice and investment diligence. Maher graduated with an MSc in Engineering from Stanford University and a BSc in Engineering from Syracuse University. Hocine has 30 years of engineering, construction, development and project management experience. Hocine manages client relations and liaises with architects, engineers, consultants and contractors for investment projects focused on development and construction in Saudi Arabia and the United Arab Emirates. He also ensures adherence to contracts, specifications and local building code requirements, and minimizes risks impacting project cost, schedule and quality. Prior to joining SGE, he was a development leader at Johnson Controls Inc., where he managed energy efficiency and sustainability projects. Prior to that, Mr. Remram was a department manager at Tetra Tech, Inc. in Irvine, CA, where he managed a construction and engineering department. Hocine also held managerial and engineering positions with Bechtel Corporation, Syska & Hennessey, and Skidmore, Owings & Merrill. Mr. Remram holds a Master's degree in Mechanical Engineering from Illinois Institute of Technology in Chicago, Illinois, a Certificate of Engineering from UC Berkeley and Management Certifications from the American Management Association. Hocine is a licensed Professional Engineer in the State California. Priya has over fifteen years' experience working with leading multinational companies across several industries including hospitality, event management, recruitment, advertising, television and films. She counts her creative streak as her strongest asset and has used that to her advantage in developing winning marketing and advertising strategies for her clients in India and the Middle East. 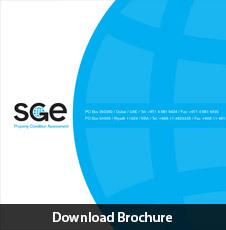 At SGE, she looks after branding and marketing of the several businesses within the group. When not focused on building the SGE brand, Priya enjoys writing and filmmaking and has won several awards for the same including BBC's Global Amateur Filmmaker award. Priya completed her Bachelors in Commerce and Masters in Marketing Management from Mumbai University with distinction. Sami has 14 years experience in finance. He has honed his skills working with international companies across industries including Sheraton Hotel in Egypt, Americana in Jordan and Al Thair General Contracting Co. in Abu Dhabi. Sami prides himself on his perfectly balanced books as well as contributing to the company's bottom line through adopting new financial strategies and initiatives. His passion for accuracy and growth match well with SGE's company vision and we consider him and integral and valuable member of our team. Sami graduated with BSc in Commerce & Accounting from Cairo, Egypt University. Muhammad drives business development for SGE. He has considerable years of professional experience in sales, marketing and corporate communication. He worked with FTSE 100 listed Energy Producer and distributor in London for several years. Later he joined with one of the largest financial organization based in Canary Wharf, London, where he worked for seven years. Prior to joining the SGE Team, Muhammad worked for a top tire property developer in Dubai. He has led highly successful sales teams across the globe and has managed to close around AED180 million (US$52 million) of business in one year at some point in the course of his successful career. Muhammad has passion for excellence and business expansion through ideating and implementing market development initiatives and effective teamwork. He holds a MA Degree from Middlesex University London and MBA from London South Bank University. Since obtaining his Bachelor of Commerce degree from the University of Calicut, India, Thuhleef has gained over 10 years of experience in Sales and Marketing working for leading multinational companies such as Vodafone and Tata Motors as a Sales Executive/Business Development Manager. Thuhleef is a team player who possesses an outstanding willingness to learn. He also has an aggressive approach to achieving his goals which matches well with his position as a member of the Aladdin Business Development team. Rimshid graduated with a Bachelor of Business Administration degree from India and thereafter embarked on a career as a Sales Executive. Prior to joining the Aladdin Team, Rimshid worked for AROMA, a 3M distributor firm that is part of the DELIGHT group of companies in GCC, where he was primarily responsible for identifying and targeting new business prospects and developing strong working relationships. He is now a part of the Aladdin Business Development team. Rimshid is indisputably a self-motivated, tenacious young man who stops at nothing to accomplish his goals. Haitham holds a Bachelor of Commerce and Business degree and is currently pursuing his Masters in Bachelor Administration. He has over 8 years sales and marketing experience in the Middle East and North Africa region where he worked for some of the most prominent companies in IT solutions and automotive spare parts distribution in the Middle East, amongst them, S.S.lootah international group and A-MAP. Haitham was responsible for managing customer relationships, generating leads and conducting after sales services. He is now a part of the Aladdin Business Development team. Abnal has over 7 years of Sales Leadership, Channel Management and Organizational Development experience in Technology Solutions. Prior to joining the Aladdin, he worked for prestigious multinational companies, amongst them, Microsoft Corporation and SAP partners where he built a strong record of developing new business and strengthening customer/partner relationships through his remarkable negotiation and communication skills. He is energized by new challenges, challenging the status quo to discover better ways of doing business. Abnal is passionate about planning, goal setting, strategy implementation and execution which makes him a perfect match for his position on the Aladdin Business Development team. Abnal holds a Bachelor of Science degree in Information Systems from Zimbabwe. Edward brings several years of experience in the inspection industry after having worked for City Engineers Office in the Philippines and a number of multi-national inspection companies thereafter. During his time with these prestigious organizations, Edward was entrusted with handover, resale, solution investigations and building condition audit for villas, apartments and high-rise buildings. He is a certified InterNACHI property inspector. Edward is a creative, hard-working and diligent learner who holds a Bachelor of Science in Civil Engineering. His dependability and passion for excellence has led him to be one of the best inspectors not only at Star Property Inspection but in the industry as a whole particularly in the Middle East region. Akbar is an ambitious, self-driven individual who obtained his Bachelor of Engineering in Electrical and Electronics degree from Anna University, India. Prior to joining Star Property Inspection, Akbar worked for several facilities management firms as a Facilities Engineer where he was primarily responsible for, amongst others, conducting building conditional survey and generating snag reports, property asset performance monitoring and enhancement, preventative and reactive maintenance, and managing statutory requirements and subcontractors. Akbar is now further developing his skill set as an inspector at Star Property Inspection. Shuja is one of the inspectors at Star Property Inspection, holding a Bachelor of Technology in Civil Engineering degree which he attained from India. Prior to joining Star, Shuja worked as a Civil Engineer for prominent construction companies in a globally competitive environment. He is a hard-working and self-motivated young man whose passion for the industry causes him to strive for perfection on every assignment. Tendai is a vibrant and determined young lady who holds a Bachelor of Commerce degree (Accounting and Finance major) from Curtin University, Australia and PRINCE2 Certification in project management. Prior to joining the team, she was employed by a prestigious energy and infrastructure development firm where she acquired extensive experience in project management after having been involved in some of Zimbabwe’s largest power expansion projects. Her current role as Administrative Assistant matches well with her unwavering desire for order and excellence. She is presently responsible for, amongst others, providing administrative support to the Directors in the various disciplines, coordinating in-house activities, providing administrative support to the Inspectors and the Sales Teams.